In this interview, Kodak Girl and vintage-photograph collector Martha Cooper talks about early Kodak advertising and how women have been portrayed in Kodak ads over the years. Cooper also discusses other Kodak related ephemera and her broader interest in snapshots featuring women with cameras. Cooper can be reached at her website, www.kodakgirl.com. My father had a camera store, so I grew up with cameras and used Kodak film. These days I like digital better, but I still have a soft spot in my heart for Kodak. One day at a flea market, I came across a couple of early Kodak ads featuring women with cameras. I was taken by the difference between these early ads and those of today. In the early ads, the women depicted looked like photographers: They’re out in the world, traveling around carrying their cameras. They look like they’re really taking pictures. Today’s ads are more about beautiful women posing with cameras. I just love the early ads. I did a little research and found out that Kodak actually had what they called the Kodak Girl. So I started collecting. I have so many ads now. If I see one of a woman with a camera that I don’t have I’ll buy it, but I pretty much have them all. Plus, I live in a one-bedroom apartment in New York City, so I’m out of space. My book, “Kodak Girl,” is coming out in 2010 through Steidl, a German publisher. It’s pretty much just photographs of women with cameras. It also includes all the miscellaneous collectibles, like little figurines of people and animals with cameras, as well as Kodak advertisements. The idea was to illustrate particular objects relating to our perceptions of women with cameras. Somebody from the Eastman House is writing the introduction. Collectors Weekly: What were some of the first cameras you used? Cooper: My first camera was the Baby Brownie Special. It was just a little square box camera with an Art Deco style. I don’t collect cameras, except for the kind that don’t take pictures. 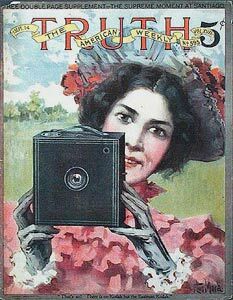 In 1916, when this Kodak catalog was published, women were depicted as photographers rather than subjects. I have a collection of doll cameras, for example. They’re all at my Kodak Girl website, under “Toys” and then “Doll Cameras.” I have a collection of Barbie cameras. Plenty of Barbie cameras actually take pictures, but I only have the half-inch doll Barbie cameras. Barbie had some pretty heavy cameras with telephoto lenses and things over the years. For years I would go to flea markets to add to my collection, but with eBay I can search very specifically for things I want. It’s really helped me refine my collection. Now I mostly just collect snapshots. The snapshots I collect all have to have a woman and a camera in them, unless it’s something super unusual. There’s a lot of competition on eBay, so it’s not as if I can afford to buy every photo I like. I have to be pretty selective. Lately I’ve been losing most of the auctions I bid on. Collectors Weekly: Found photographs have taken off in the last few years. How long have you been collecting? Cooper: I used to collect snapshots or so-called found photos in the flea markets. They used to be hard to find there. I think most people just threw them out, but then it became known that some people would actually buy them. So there have been a lot of exhibits and books on found photos by anonymous photographers. I’m quite charmed by them. Collectors Weekly: What sparked your interest in the Kodak Girl? Cooper: Just seeing this energetic woman with a camera interested me. At the time I was a photographer at “The New York Post,” the only woman photographer on staff. It was exciting to see these early images of women with cameras when I was so used to seeing only men with cameras. I also liked that she was called the Kodak Girl. It turns out that there have been professional women photographers right from the start. I have a lot of cabinet cards and carte de visites with the names of the women who took the pictures on the back. So there were always professional women photographers, but somehow this was not communicated to me when I was growing up. George Eastman, who founded Kodak, had a quote about how a woman could sell more cameras than a man, something sexist like that. I think he basically felt that a woman looked prettier, but at least they depicted her as a real photographer. 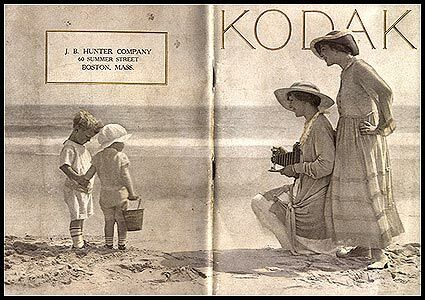 Kodak published pocket catalogs between 1914 and 1926. Women were portrayed as active photographers. This was in the earliest days of advertising, as well as the early days of photography. It wasn’t like there were advertising companies that would design your ads for you. I think Eastman thought the early Brownies would be easy for women to use because they were snapshot cameras—that was his contribution to photography, as I understand it. He was marketing the cameras for amateurs and he correctly understood that women were the ones who wanted to take family photos and make the albums to preserve the family history. So the Kodak Girl is always holding the camera. She looks like she’s taking pictures and is not just standing there and smiling. Kodak was selling the idea of women taking pictures. Later on, in the 1930s, there was a shift to the man as the authority figure holding the camera, with the woman standing by or being the subject. If you look at the ads on my website, though, you see adventurous, lively women by themselves. They might be standing in the snow, in bad weather, or they might be abroad somewhere like Japan. By the ’50s and ’60s, you started seeing ads featuring little families—the husband, the wife, two kids, that kind of thing. Kodak actually solicited photographs to use in their early advertising from people who were using their cameras. Because the ads had sort of a sexist theme, people mostly sent in pictures of women on horses, snowshoes, or ice skates. There was an ad showing a woman with a tennis racket, that kind of thing. Contests determined the winning photos: People would enter their photos, and the winner would be used in the ad. Kodak also promoted its cameras to children. They had the slogan, “Let the Children Kodak.” So in the ads, you’ll see as many little girls as little boys with a camera. People also sent those in. Collectors Weekly: When did Eastman create the Kodak Girl? Cooper: I’d say in the 1880s. I think the first Brownie was released in 1888. 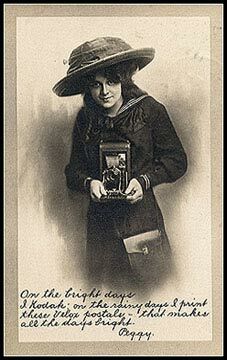 I know for sure there was a Kodak Girl by 1900. I believe Kodak’s first ads were just text ads. They didn’t show any pictures at all, or maybe just a little drawing of the camera. The ads reflected the times. During World War II, for example, there were ads showing women at home, saving pictures or sending them. In another ad you’d see the guys in their military uniforms opening envelopes with pictures inside them. The slogan was something along the lines of ‘When your man’s away, send a picture’. Over time, there was a move away from the single, independent woman. Collectors Weekly: What other types of Kodak ephemera do you collect? Cooper: I don’t only collect Kodak stuff, and there are many categories that have nothing to do with photography but that happen to show a picture of a woman and a camera. Honestly, I don’t care what the pictures are advertising. I’m way more interested in the graphics. 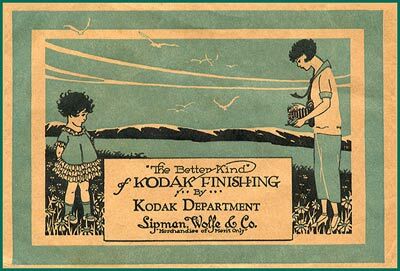 Around 1910, Kodak produced advertising postcards that were designed to look handwritten. In the 1890s and early 1900s, there were a lot of trade cards—little playing-card-sized cards with an ad for some product on the back and a picture on the front. Companies could buy these cards and put whatever ad they wanted on the back. Every so often you find one that happens to have an ad for a photographer with a picture of the photographer on the front, but often the pictures of the photographer and the back advertise something completely different. There are a number of those on my website. There was also something called the poster stamp, which was a stamp used for advertising. Often it had something to do with photography. It was only as big as a postage stamp, and it didn’t have any value in terms of sending a letter, but the graphics are interesting. I look for those on eBay, trade cards, anything at all. Even a playing card might have a woman and a camera on the back of it. I’m also a big postcard collector. There’s something called a real photo postcard, which is actually made with a photographic process. These cards also have different kinds of art on them. Some of these cards were made by well-known artists of the times. The cards weren’t advertising cameras: They were often making jokes about cameras or just showing a beautiful woman with a camera. There’s a postcard section on my website. Again, it’s hard to find one I don’t already have. For me, it’s all about the image: How is this woman depicted and what is the art? Some of the nicest art was on the covers of camera catalogs. The covers on some of them are just phenomenal. Collectors Weekly: Would you say the Kodak Girl started the trend of showing women with cameras in other types of advertising? Cooper: I would. For me, when I say “Kodak Girl,” it doesn’t have to be Kodak. For me it’s a broader category. For example, I love the envelopes that were used when people would pick up their negatives and film. They’re called film wallets. Some of the graphics on these film wallets are just wonderful. I might have the biggest collection of them anywhere. Collectors Weekly: Do you collect from specific eras? Cooper: I concentrate on the years before 1930 because after 1930 I don’t find much good stuff. On the other hand, if I see an ad with a woman and a camera in a new magazine, I might rip it out, date it, and keep it just for comparison’s sake. I’m not actively looking for anything past 1930, but if I see something interesting, I’ll certainly keep it. For example, before color printing, Kodak Girls were hand colored. I like that muted look a lot. Film wallets were used by photo finishers as sleeves for prints and negatives. This one shows a woman taking a picture of a little girl. The Kodak Girl mostly disappeared after 1930. Ironically, most of the early Kodak Girls were painted rather than photographed. Around the 1930s, Kodak made a series of cameras that were especially for women, in different colors and everything, but the ads I have for those cameras don’t show women using them. Something must’ve changed in terms of what people were expecting from an ad, but I’m not sure what that change was. There’s a great website, Gloriously Colorful Kodaks, that has pictures of the colored cameras with quotes like “For the smart modern girl, a smart modern Kodak, one that charmingly combines a gay new note with the never-ending pleasure of picture making,” or “The Vanity Kodak comes in five lovely colors.” But none of these ads featured Kodak Girls. Collectors Weekly: When you started collecting ephemera, was the focus always on Kodak? Cooper: Actually, I started by focusing on images of people, or even animals, using cameras. It was a collection about photographers with their cameras. I used to go to antiques shows that had some paper ephemera, and stuff like that. You could only find one or two items each time you went. I might drive several hours to Pennsylvania for one of these shows and not be able to find a thing. With eBay, of course, you can find this kind of material all the time. For example, when I was going to flea markets and antiques shows, if I saw an interesting catalog cover with a woman and a camera, I might buy it even if it cost $100 because I didn’t think I’d ever see another one. Now with eBay, you might find out that that same catalog is fairly common. So eBay has adjusted the market, but some things are still incredibly expensive and rare. Collectors Weekly: Are a lot of the photographs you collect one of a kind? Cooper: In one way or another, they’re all one of a kind. Every so often, though, a seller will put up, say, a wonderful photo of a woman with a camera, and I’ll bid a lot of money for it. The next thing you know, the same photo comes up because the seller had two prints of it. Mostly, though, they’re one of a kind. Collectors Weekly: How has your collecting influenced your photography? 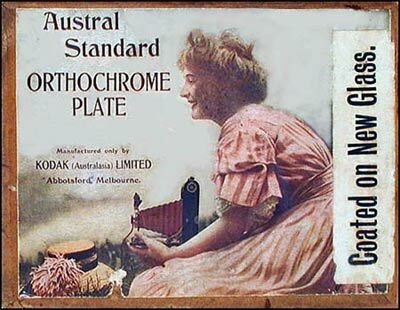 Even the boxes that housed Kodak’s glass orthochrome plates (this example is from Australia) showed Kodak Girls taking pictures. Cooper: I think the snapshots influence me the most. I consider myself a street photographer rather than, say, a studio photographer. If you Google my name, you’ll see that I’m a hip-hop photographer. I’ve published many books that have nothing to do with the Kodak Girl. It’s like I live two separate lives. But I was taking pictures for probably 30 years before I started looking at snapshots, so it was a later influence. I’ve had a lot of cameras over the years, but I didn’t get a 35mm camera until the ’60s. I have a little point-and-shoot now that I take out. It’s digital and not professional quality but it’s easy to carry around. It’s not heavy. Collectors Weekly: Can you give us an example of a recent addition or favorite piece in your collection? Cooper: The last thing I bought on eBay was a glass negative of a woman and a camera. I didn’t have any glass negatives, so I thought that would be an interesting addition and a different item to collect. If you go to the Kodak Girl website and click on “Photos,” there’s an image of a woman standing in a motorcycle sidecar while taking a picture. That’s one of my favorites. She’s in the act of taking a picture. She’s not just holding the camera up and smiling. Collectors Weekly: Who were the Kodak Girls in real life? Cooper: Some were theater actresses, personalities, people like that. For example, Eleanor Boardman, a silent movie star, was a Kodak Girl. She was born in 1898 in Philadelphia, became an Eastman Kodak Girl, and attracted the attention of director King Vidor in Hollywood. One of the original models is still alive. The women in my photo collection, though, are mostly anonymous. Occasionally, somebody’s written on the back of a picture, so I have a section on my website for annotated snapshots. I have another section for actresses with cameras. Historically, most Kodak ads have depicted normal people. They’re not celebrities endorsing products or anything like that. Kodak was positioning its cameras as a normal part of everyday life. The first one I know of was published in 1890. It features only women, with a quote on the ad that reads, “Oh, isn’t it lovely? 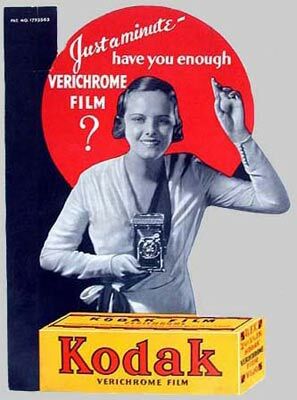 I must have a Kodak.” That’s one of their very first ads. 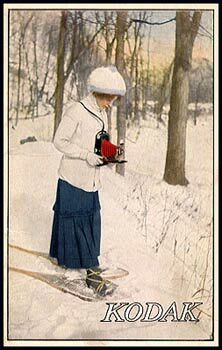 There’s another one from 1891 that shows a woman out in the winter scenery with her camera, taking a picture of somebody ice skating. If you look at the ads from 1904, you’ll see a mom taking a picture of her little girl in bed. In an ad from 1905, you have a little girl taking a picture of her baby brother. In 1906 you have a scene with a brother and a sister, but it’s the sister who’s taking the picture. The woman who made that 1906 ad was a well-known artist of the day. She had the choice of giving the camera to the boy or the girl, and she gave it to the girl. I think that’s interesting. I have three samples of the slogan, “Let the Children Kodak,” from 1908, 1909, and 1910. In all three it’s a little girl who’s taking the picture. When I was growing up in the ’60s and ’70s, it wouldn’t have been the little girl. Photography was a guy thing. Collectors Weekly: How did the depictions of women in camera advertisements change in the ’60s and ’70s? 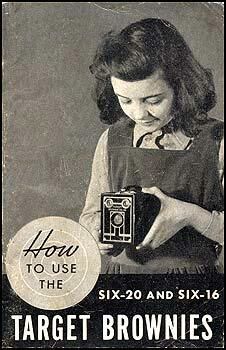 Kodak instruction booklets were often pitched directly to young girls. Cooper: The women became models with cameras as opposed to photographers. I’ve collected some of those, but I don’t have them on my website. They’re not interesting to me. I don’t really know how the public reacted to those ads. I assume that many people saw those ads, and that a certain number of women then decided to go out and buy a camera to take some pictures of their families. I’ve worked on some children’s books and have been told by the editors that girls will read stories about boys, but boys don’t like to read stories about girls. Therefore, it’s better if your protagonist is a boy. My guess is that camera manufacturers thought the same thing, figuring that women would buy cameras if men were shown in the advertisements but that men weren’t as likely to buy cameras if women were the ones doing the selling. In the early days, though, the reason to show a woman with a camera was to say, ‘It’s so easy, even a woman can do it’. It wasn’t necessarily a positive statement on George Eastman’s part to feature women, but they sure sold a lot of cameras. I bought a large, framed photo-picture of Kodak advertising (12 to 15 years ago), two dogs (one dressed in ladies’ clothing and one dressed in a man’s suit) dressed up with ‘church-going’ clothing, hats, the whole works. The lady who sold it to me had an extremely large miscellanous dog collection, she thought this was an advertising picture from the 1950’s, but because of her failing health, couldn’t remember for sure. She was going into the nursing home and couldn’t take most of her beloved objects. Does this ring any bells as to what series this represented, when Kodak advertised with animals dressed as people, etc.? I would be greatly appreciative. Thank you. I’m writing a historical book on WW I and Mena Edwards(Reiss) is an important character. She is described in research as a Kodak GIrl. Does anyone have a picture of Mena that they would give me permission to use with credits/footnote? I would love one. Many thanks. “ ” You have to look at whether there was a trade network, essentially a human-trafficking network, in children.